Don’t be mislead by the light-hearted name, Porky is a man who takes partying very seriously. David Leon, as he is otherwise known, is the wildcard of Desert Hearts, the San Diego-bred crew of DJs and rabble-rousers tearing up the underground with deep, dark, and weird house and techno.A San Diego native, Leon was influenced early on by older brother Mikey Lion and dusty jaunts to Lightning in a Bottle and Black Rock City, but over the past two years, his renown as a DJ and chops on the decks have grown to match his larger-than-life personality.Porky leveled up his game performing in the mystical jungles of Tulum, the dusty expanses of Burning Man, and perhaps most notably, at the bi-annual Desert Hearts weekenders in Southern California. The group’s ascent from a renegade rager to a dance music phenomenon that has been one of the most celebrated stories in dance music over the past couple of years, and Porkchop’s standout sets and take-no-prisoners party attitude have been at the center of the whole whirlwind.In a sea of black-shirted stoics, Porky pours himself into the DJ booth bursting with life and color. His hair and clothing melt into bright gradients and he smiles unpretentiously as he deals out techno obscurities and house crowd-pleasers alike. His sets are a reminder of why we’re all on the dancefloor in the first place––to party. And nobody gets the party started like Porky. He’s noted for being one of the most versatile member of the Desert Hearts Crew. His ability for weaving narratives through genres is clear, and he has a knack for dropping tracks that become moments you remember.With hair in technicolor and his USB filled at all times with dancefloor demolishers, bursting with love and positive vibes, Porkchop has developed into one of the most unpredictable, but dependable DJ’s in the whole scene. He’s earned his way onto stages with the likes of Lee Burridge, Justin Martin, and Tale of Us, played festivals like Symbiosis and Envision in Costa Rica, five-time veteran at Burning Man, playing iconic camps like Robot Heart and Distrikt, and all over North America with the hot-ticket City Hearts tour. This is just the beginning as Porkchop is only rising. All signs point to 2017 being the Year of the Chop as he cements his place in the highest echelon of underground dance music. The sun fades, the last glitter trails of light hit the shimmering and spinning dusty desert disco ball. A throng of dedicated and debauched hard partying Marbie’s Barbies hurtle their way towards center stage (really…they’re Barbies), educated party-goers make their way to the dance floor, no questions asked, while whispers of "King of Darkness, crazy house and techno, psychedelic vibes” spread through the new night sky. The first melodic notes travel the space, ethereal beauty pouring from the stacked Funktion speakers, waving its way through the crowd. Your eyes close, your body grooves to the sounds and the beats and the thuds of the tech house that is now expertly laid out for all to enjoy. Dark and driving, thumping techno is paired with mystical, beautiful, melodic house. That passionately and expertly paired genre bending style can only mean one thing. Marbs has taken the decks.Having grown up in Southern California with the now notoriously known motley crew called Desert Hearts, Marbs, an artistic kid, was primarily influenced by legends like Pink Floyd and Tool, while also listening to underground hip hop, reggae, and rock, displaying his no holds barred love for all genres from an early age. Flash forward to San Francisco's Love Fest, art cars roaming the city, house music spilling from speakers, and Marbs’ musical tastes were forever changed thanks to ruler of the house music game and party guru, Lee Burridge.After years of djing the San Diego, LA, and Burning Man party circuits, the Desert Hearts crew took it upon themselves to throw their own kind of party. One built on love, acceptance, and strictly, House and Techno, their 2012 one time gathering of 200 people in the Mojave (the coldest one ever, we swear!!) has turned into one of the most talked about and adored boutique festivals in the US. None of which could be possible without Marbs, lovingly coined, "Papa Bear", he is truly the backbone of the project behind the scenes, where he runs most of the logistics with a steady hand and a humble heart. He’s easily one of the nicest guys on the planet and is the most modest of the crew, which is insane given his endless barrage of talents beyond his musical endeavors. 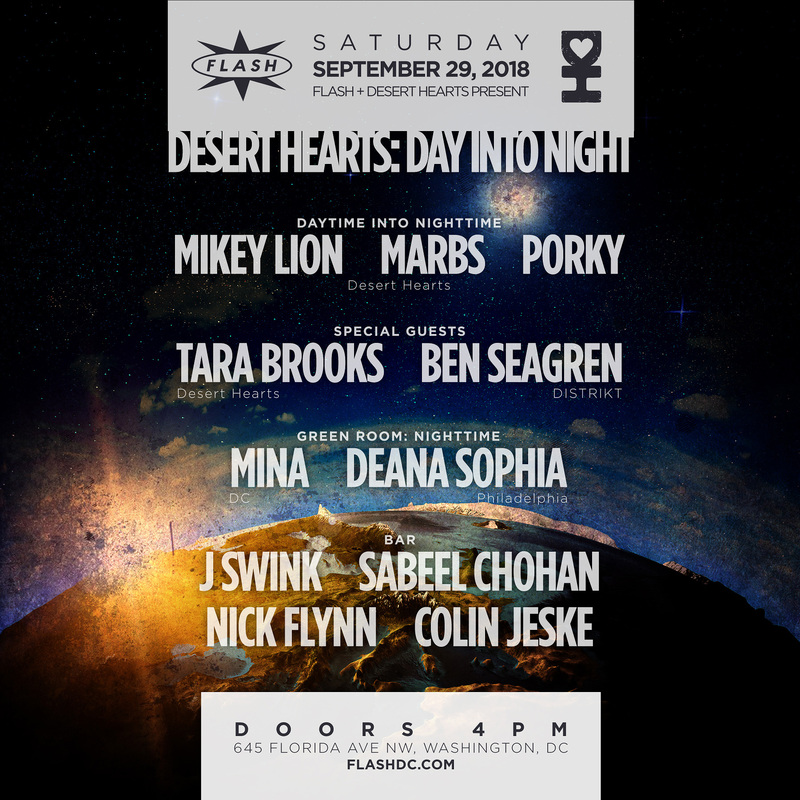 While Desert Hearts catapults successfully into the scene as a major player through their twice yearly festival, touring internationally throwing parties under the moniker City Hearts, and launching a (free!) record label, Marbs continues to hone his production skills and also blows the art game out of the water, hand drawing all of the label’s artwork and inspiring tattoo artists everywhere.Marbs’ musical talents and humble dj presence commands any dance floor with his sounds of mystical darkness and whimsical tribal rhythms; the night sky is the limit for this King of Darkness. With a sound like no other, a heart of gold, and a determination matched by few, Marbs is sure to lead this movement of love until the very happy end. Over the past five years, the Desert Hearts Family has found itself at the center of a dusty movement, fostering intimate experiences of sonic joy and unbounded love across the globe. Part boutique festival, part record label, and part globetrotting party brigade, this ragtag crew of dreamers has emerged as a vibe-focused force radiating a conscious ethos of House, Techno and Love.In November 2012, Desert Hearts began as a 200-person renegade gathering deep in the Mojave Desert, dreamt up by the DH’s founding quintet of Mikey Lion, Lee Reynolds, Porkchop, Marbs, & Kristoff McKay. The intrepid crew barely survived a set of extreme weather conditions and unfortunate circumstances, but that first party sparked a fire.In just a few short years what began as a nomadic gathering of friends, has evolved into the darling of the West Coast house and techno scene. Though each edition of the festival may sell out, the DH Crew made the decision to keep the events intimate, ensuring that the love, radical self-expression and positive energy of that first adventure remains at its beating heart. It’s what has attracted world-class bookings like Tiefschwarz, DJ Harvey, Monkey Safari, Rodriguez Jr., DJ T, Claude VonStroke, Marc Houle, Olivier Giacomotto, Mark Henning, M.A.N.D.Y, and many more.2014 saw the launch of Desert Hearts Records, a totally-free record label embodying the musical sensibility of the movement, while providing a platform to foster established and emerging talent from around the world. Entirely curated by Mikey Lion with Marbs handling the artwork for the label, past releases have included Andreas Henneberg, Latmun, The Glitz, jozif, TÅCHES, Dance Spirit, Fritz Carlton, Kevin Anderson, RYBO, and of course records from the core Desert Hearts Crew.The beating heart of Desert Hearts is its founding fathers. A suitably colorful cast of characters, who fell into each other's lives skating and surfing around the beaches of San Diego. Led by top hat sporting label boss Mikey Lion, the core crew is rounded out by ex-pro BMX legend turned DJ, Lee Reynolds, the artistic backbone of the crew, Marbs, Mikey’s younger brother & absolute madman, Porkchop, and renegade visionary Kristoff McKay.If the Desert Hearts festival is the epicenter of this movement and the record label its voice, then the roaming City Hearts party series has become the legs that carry this evangelistic cause around the country. A roaming urban distillation of the festival, City Hearts has been sprinkling a little bit of California magic dust across the country and beyond, winning hearts and minds and selling out shows in Los Angeles, New York, Tulum, Mexico City, Miami, San Francisco, Houston, Chicago, Toronto, Denver, and more with more massive showings on the horizon.Desert Hearts has given rise to a family of tens of thousands and it's safe to say the Love Movement isn’t slowing down anytime soon. Everyone that attends our events is part of our family and who are what makes the tangibly delicious vibe so astronomically good. There is no Desert Hearts without the Family.